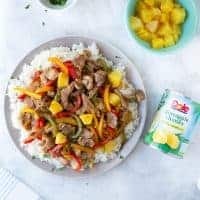 Pork & Pineapple Stir-Fry! Full of thinly sliced pork tenderloin and veggies all coated in a sweet and simple pineapple sauce. 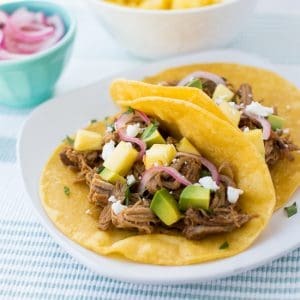 An easy weeknight dinner! 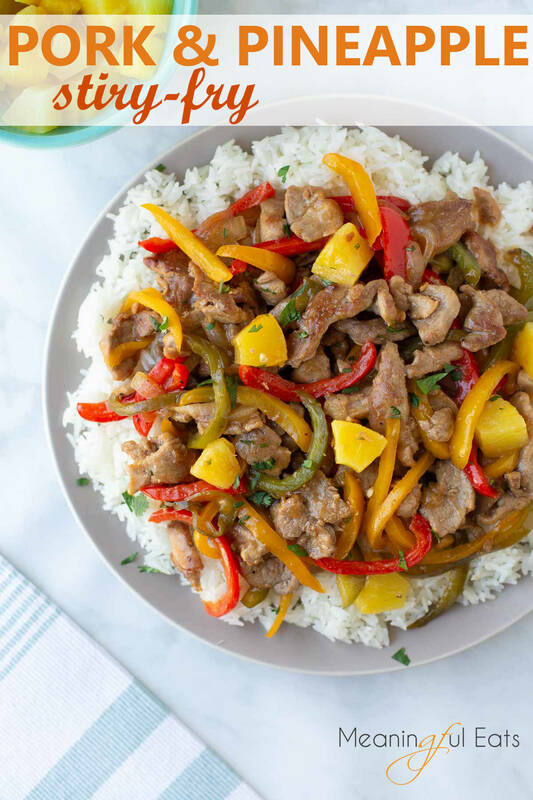 Pork & Pineapple Stir-Fry! My family always loves stir-fry night and this recipe is a favorite. 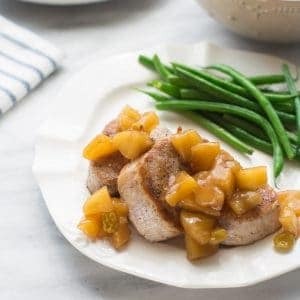 It’s full of thinly sliced pork tenderloin and veggies all coated in a sweet and simple pineapple sauce. It also comes together in 30 minutes making it perfect for a busy night! Using pork tenderloin in stir-fry is such a great way to switch it up from the usual chicken or beef stir-fry. I like using pork tenderloin better than other cuts of pork because it keeps a nice tender texture rather than becoming chewy. Coating the thinly sliced pork in a little cornstarch helps to achieve that restaurant-style brown coating. It also helps the sauce to nicely coat every piece of meat. 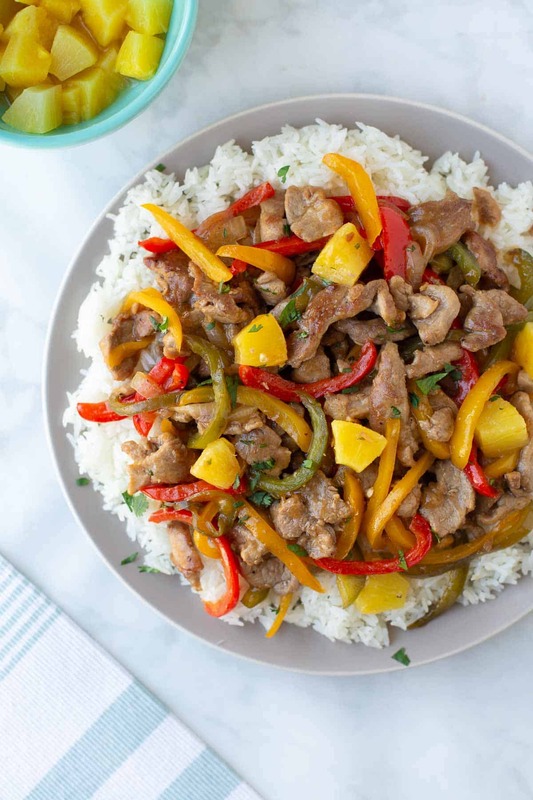 This stir-fry is full of brightly colored bell peppers which pair deliciously with the pork. For the stir-fry sauce, use the juice from a can of Dole Pineapple Chunks as a base. Then mix it with gluten-free soy sauce, brown sugar, a splash of vinegar and a pinch of red pepper flakes to create a deliciously balanced sweet and savory sauce. Be sure to thinly slice everything and have the sauce mixed and ready to go before you start the cooking process. Stir-fries come together quick, so it’s helpful to have everything ready before you start! I also like to start some jasmine rice in my instant pot while prepping so everything is ready at the same time. At the end of cooking I mix half of the pineapple chunks into the stir-fry. My kids love to eat the rest of the pineapple chunks with dinner. Add some steamed rice and you’ve got a kid-friendly dinner everyone will love! Serve with steamed rice – Enjoy! 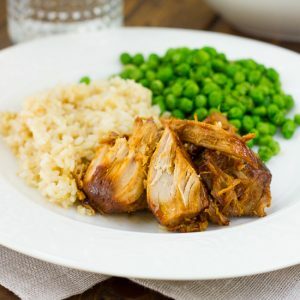 An easy, healthy weeknight meal that kids love! 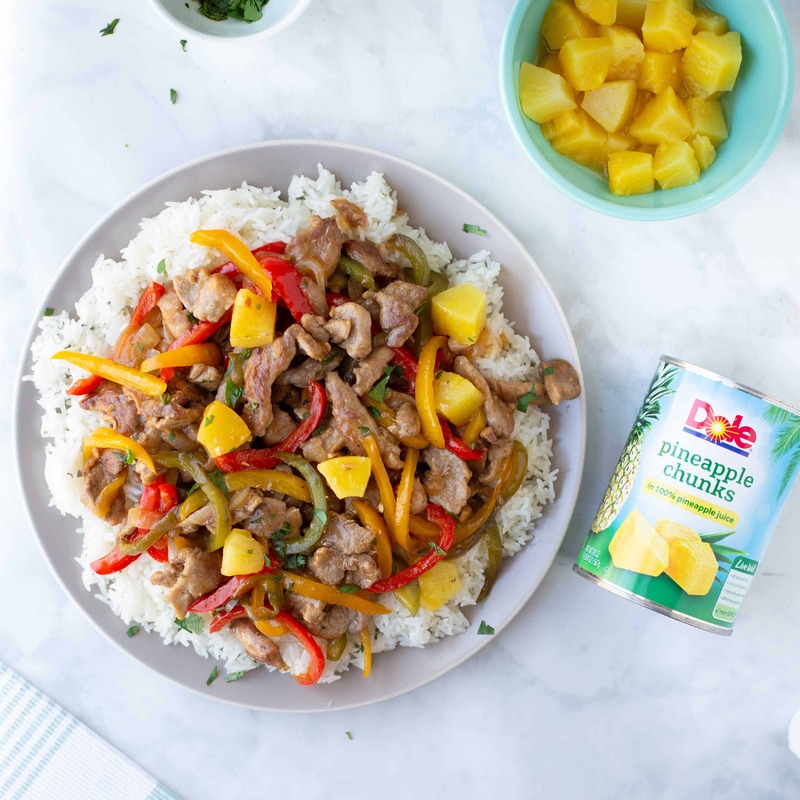 Full of thinly sliced pork tenderloin and healthy veggies all coated in a sweet and simple pineapple sauce. Note: Before starting to cook, be sure the pork, bell peppers and onion are all sliced and the sauce is ready to go. The cooking process for this stir-fry is fast so it’s helpful to have everything prepped! Place the thinly sliced pork tenderloin in a bowl, sprinkle with the cornstarch, salt and pepper and toss to evenly combine. Open the can of pineapple and drain the juice into a measuring cup. Add the remaining sauce ingredients and stir to combine. Set aside. Place a large non-stick skillet over medium-high heat. Add 2 tablespoons of oil and heat for a minute or so until hot and shimmering. Add 1/2 the pork tenderloin and cook in an even layer, not moving for 3-4 minutes until browned. Brown on the other side then transfer to a plate. Repeat with the remaining pork tenderloin adding more oil if needed. After browning the pork tenderloin, add the peppers and onions to the now-empty skillet and cook until softened, about 2-3 minutes. Add the pork back to the pan along with the sauce and 1 cup of pineapple chunks. Cook until the sauce has thickened and everything is bubbly and hot. Serve over hot rice with the remaining pineapple chunks on the side. Enjoy!